One by one, the names of Farias Early Childhood Center students are called as the morning attendance is taken. When there is no response – no “Here!” or “¡Aquí!”– a child stationed at the front of the classroom carefully removes that classmate’s photograph from the outside of the “We Wish You Well” heart and places it inside the heart. 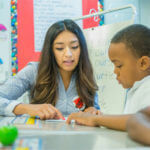 Castillo-Guzman, who spent the week of May 15 in the Houston Independent School District (HISD) as part of the College of Education’s Educate U.S. initiative, plans to adopt the heart-shaped ritual for her eventual classroom. It’s not the only Texas inspiration she plans to pay forward in her teaching career. “The teachers there, man – they’re just so loving,” says Castillo-Guzman, a senior from Rochelle. Educate U.S., a component of the college’s hands-on Educate and Engage Program, enables select participants to work side-by-side with mentor teachers, observing in classrooms, preparing lessons and engaging in co-teaching strategies. 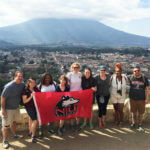 NIU students chosen for the donor-funded, all-expenses-paid journey further enrich their experience by joining with Houston students, host families and community members in a variety of extracurricular and community events. And as much as the NIU students relish their transformational time in Houston – “This trip was amazing, and I miss my host family already!” one posted on Twitter – the HISD hosts call the feeling mutual, says Jennifer Johnson, the college’s director of teacher preparation and development. Visiting the HISD classrooms during the last week of the school year allowed the 20 students from NIU to observe assessment and grading as well as “closings and transitions,” Johnson says. “They got an idea of how teachers get the students ready for the next year, where they think the children should go from here and what would be the best fit for them,” she says. Portia Downey, professional development coordinator in the College of Education, returned to DeKalb with a folder full of sticky-back visitor badges she acquired while observing NIU students throughout the 284-campus school district. Downey saw the 20 Huskies engaged in decision-making over grades for HISD student report cards. She saw them learning how HISD teachers work in teams. She saw them collecting strategies for differentiating curriculum for bilingual and ELL students. “It was really eye-opening for them,” Downey says. Emma Foelske, a Middle Level Teaching and Learning major from Batavia, confirms that she returned to Illinois with a new view. She spent her week rotating through sixth-, seventh- and eighth-grade social studies classes. Like Castillo-Guzman, she found “a lot of ideas” to borrow for her own career. Castillo-Guzman, meanwhile, is picking the pre-school route to make good on a goal formed at her church as she taught Sunday School and Vacation Bible School. May 2017 Educate U.S. participants reporting for duty!